The topic of stem cells has held public attention for over 25 years. The ability for these cells to restore and repair has made them a beacon of hope in the medical field. While stem cells may hold the key to many future treatments, many are unaware that they are currently being used to successfully treat many painful conditions. A new approach to pain management includes using stem cells to tailor treatments to the individual person, even if they have a rare or extreme condition that’s traditionally difficult to treat. Not only do stem cells work to reduce the pain and inflammation associated with painful conditions, but they also work to repair and regenerate damaged tissue at the cellular level. These regeneration capabilities make their application toward chronic pain conditions a logical step. Stem cells are undifferentiated which means they have the potential to develop into a wide variety of other cells, allowing for success in helping to heal bone, damaged nerves, worn joints and soft tissue damage. In particular, stem cells are an excellent treatment solution for painful back conditions such as degenerative disc disease, stenosis, herniated discs, scoliosis and more. Stem cell treatments are also providing significant pain relief for those suffering from degenerated joint (osteoarthritis) conditions, often helping patients avoid neck, back or joint replacement surgery. Current methods for treating these conditions involve pain medications that often come with potentially dangerous side effects and invasive surgeries that can change the body’s natural structure, sometimes leaving the patient worse off than before the procedure. Interventional procedures like corticosteroid injections are also used but usually only provide temporary relief. None of these treatments work to restore and regenerate the body. The goal is to boost the body’s ability to heal, replace damaged cells with healthy cells, and regenerate tissue. This ‘boost’ can occur regardless of age or condition of the patient and allows the body to resume healing where it has stopped short of recovery and repair. This process has provided marked pain relief and increased mobility to many patients with conditions that traditional treatments had not helped. Patients receiving these treatments often experience significant pain reduction within a few weeks. And due to the regenerative capabilities of stem cells, continued gains in pain relief and mobility are often experienced for months after receiving treatment. Most importantly, the pain relief from truly addressing the source of pain and not just the symptoms is long lasting as regeneration and healing has occurred. Candidates for these treatments report the progress they have received in pain relief is lasting and they are not being required to undergo multiple rounds of treatments to get and maintain their relief. 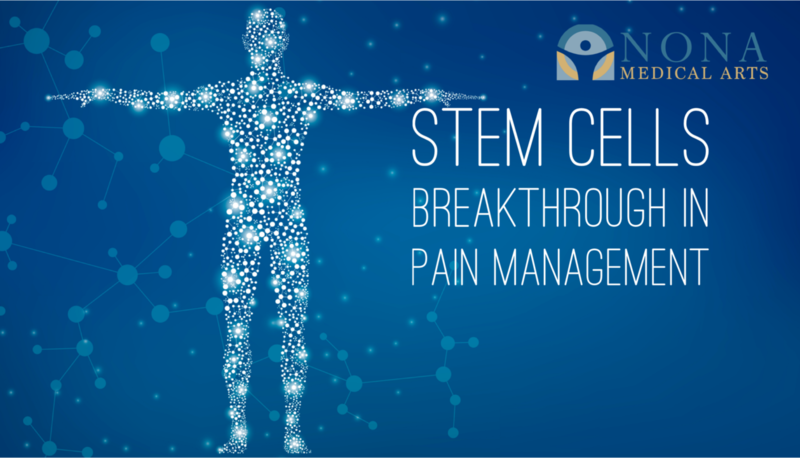 Stem cells are the future of pain relief as patients now have the ability to experience actual lasting relief through minimally invasive procedures with very little risk, no medications, and no extended recovery period that comes with surgery. At Nona Medical Arts, we are excited to be able to offer the most innovative in Regenerative technologies. If you are suffering from neck, back, hip or knee pain and are interested in finding out if you are a candidate for Regenerative treatments, call us to RSVP for a lunch-and-learn seminar or schedule a free consultation.